Interest rates in the US, Europe, Japan and the UK are hovering near zero level. They have remained more or less at that level since the 2008 US economic crisis. The Reserve Bank of India (RBI) on the other hand, had cut interest rates from first half of 2014 as inflation has been coming down. Until 2014, RBI has lowered interest rates at a relatively slower pace as compared to market expectations, because of the deep supply side and infrastructure bottlenecks in reducing inflation, especially for the consumer. The high interest rates have obviously slowed down economic growth. Borrowers worried about how the high interest rates adversely impact them. A corollary to that should be that savers are enjoying the high interest rates. In the US, UK, Japan and Europe, depositors get far lower interest rates on their bank deposits than they do in India. The high interest rates have obviously slowed down economic growth. Borrowers worried about how the high interest rates adversely impact them. A corollary to that should be that savers are enjoying the high interest rates. In the US, UK, Japan and Europe, depositors get far lower interest rates on their bank deposits than they do in India. Does this make Indian depositors wealthier than those in the US and Europe? Does it mean that Indian depositors are rewarded more by Indian banks? In reality, however, it is not the correct picture. The nominal interest rates (which you get upon investing in a bank deposit or a debenture) have moved up over the last 3 years. However, in real terms (adjusted for inflation) they have not moved much. 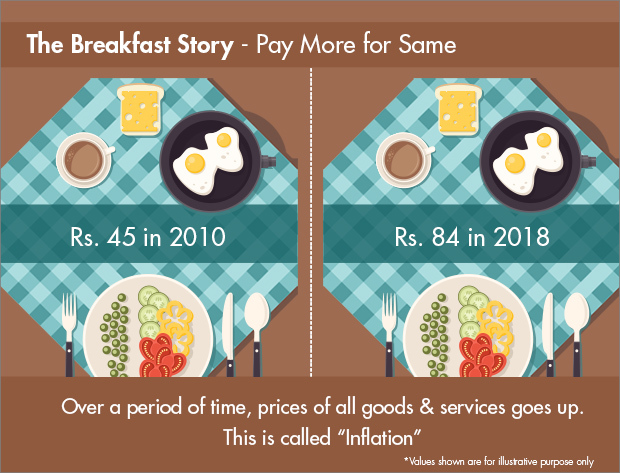 Inflation refers to the situation in which there is sustained increase in prices of goods and services leading to decline in people’s purchasing power. Due to inflation, the value of money decreases over time. This means that the value of Rs. 1,00,000 held with you as idle money will fall in value in future. Assuming an inflation rate of 7% per annum, the value falls by 86.86% in 30 years. This leads to a reduction in returns realized from our investments. While we are under the impression that we have realized extraordinary returns, when accounted for inflation, most investments like Fixed Income and Gold rarely create wealth. Real return is the difference between nominal return and inflation. Inflation erodes the pricing power and is the consumer's greatest enemy. Inflation hurts consumers more than savers. Most investors get lured in by the nominal rate of return, and do not look at the real rate of return. Inflation erodes their savings silently. Real return is the difference between nominal return and inflation. Inflation erodes the pricing power and is the consumer's greatest enemy. Most poor people are only consumers and not savers, so inflation hurts them the most. Here's a story about a friend who learnt the difference between real and nominal return at a great cost. He wanted to buy a property in Mumbai in the year 2000. He parked his savings in liquid assets as he would have needed money at any point of time to pay for the property. He often came close to buying a property, but could not close the deal for one reason or another. Most times the price was too high. Sometimes he waited, as the price was expected to fall, or interest rates were expected to come down. In the end, property prices inflated away many times the return of his liquid assets. While he could have bought a 4 BHK flat in the year 2000 at approx. Rs. 1 crore, he had to settle for a 2BHK flat in 2008 for Rs. 1.81 crores. His liquid assets after tax had given him a return of approximately Rs. 81 lakhs over a period of 8 years, but property prices had increased by almost 4 times In that period. At the end of the day, inflation silently took away half his property. The 'Sachaai' of financial independence starts with early saving in order to allow the magic of compounding to work in your favor. The cost of delay while investing could be very severe which might impact your long term goal by a great margin.